At approximately 3:15AM on the night of November 13, 1974...Ronald DeFeo, Jr. began a murder spree at his home in Amityville, New York - the likes of which the quiet community had never seen. Using a .35 rifle, he calmly massacred his entire family as they slept. Those who died on that ill-fated night were his mother and father, two brothers and two sisters. DeFeo is currently serving out a sentence of 150 years...25 years for each murder. That much is definitely true. The Lutz family moved into the Long Island house on December 18, 1975. What transpired, according to them, was the subject of a best-selling book by Jay Anson and has become the stuff of legend. Supposed supernatural occurrences forced George and Kathy (along with their children Missy, Danny, and Chris) to flee their dream home after only 28 days. The book based on their story became a phenomenon - and the film which followed in 1979 was a major hit. If Anson took liberties with their story, the movie (directed by Stuart Rosenberg and scripted by Sandor Ster) was even more of a stretch from "the truth." The following is the account as told by the filmmakers. 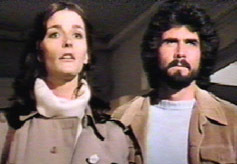 After a brief prelude showing the murders, George and Kathy Lutz (James Brolin and Margot Kidder) are seen checking out their prospective new riverfront home. Mrs. Townsend (Elsa Raven), the realtor, is showing the newlyweds around. The couple are apprehensive about the house's history at first...but the price is good and they decide to take it. After they leave, Mrs. Townsend gets an uneasy feeling and makes a hasty exit. That evening, George and Kathy put their little ones to bed. (Their names were changed for the movie to Amy, Greg and Matt - and are played respectively by Natasha Ryan, K. C. Martel and Meeno Peluce.) Father Delaney tries to call the home but gets cut off and ends up with his hand burned. George feels unusually cold...which Kathy suggests is due to a draft coming from the basement. 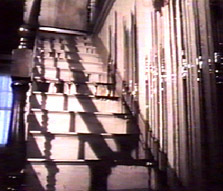 George heads down to the cellar and is followed by Matt, who trips and falls down the staircase. After taking his son back to his room, George goes back to Kathy and makes love to her. Amy has trouble sleeping and Kathy reassures her by tucking her back in bed. When she leaves, the girl's rocking chair move on its own. At 3:15 in the morning, George wakes up and checks on Amy. He then puts the dog in the boathouse, before going inside and relaxing with a cigarette. Kathy has gone shopping and returns to find George in a strange and detached mood. She's expecting her Aunt Helena (a nun) later in the afternoon and while putting away the groceries, she senses something. Amy comes into the kitchen and tells her mother that "Jody" - her imaginary friend - wants to play with her. Kathy calls Father Delaney to find out why he never came to bless the house but Father Bolen (Don Stroud) tells her that he did stop by. Delaney is too ill to come to the phone. Aunt Helena (Irene Dailey) arrives while the family is dealing with a strange plumbing problem. (Oh - just some black ooze coming out of the toilets). The boys go to greet her but Helena doesn't stay long. She too falls sick and has to leave, much to Kathy's disappointment. While Kathy is painting, George sits in front of the fire. They go to bed to try and make love but George is unable to perform and they both go to sleep. Kathy wakes up at 3:15 screaming, "she was shot in the head!" Father Bolen is driving Father Delaney to the house. The priest is determined to go back - but the car suddenly goes out of control and crashes into a sign off the road. Kathy's younger brother Jimmy (Marc Vahanian) is preparing for his wedding that day. He's nervous and continuously counts his cash to pay for the caterer. Kathy tries to calm him down and George comes into the room looking pale and gaunt. As they're about to leave, the money ($1,500) has suddenly disappeared. George offers to cover the cost until it's found. That night, Jackie (Amy Wright) the babysitter, is watching Amy. She gets locked in a closet and cannot get out. Despite her screams, the little girl doesn't respond. At the reception, Aunt Helena apologizes to Kathy for her behavior on Thursday. Everyone is having a good time except for George - who is becoming increasingly moody. When the family arrives back home, they find Jackie crying in the closet. Oddly, the door opens easily despite the girl's assertion that she was trapped. George and Kathy wonder why Amy didn't help her and Amy tells them that Jody prevented her from doing so. In addition, she claims her unseen friend doesn't like her father. George goes back downstairs to look for Jimmy's money but is unable to find it. Father Delaney is having a hard time explaining his theory about the house to his fellow priests. He claims there are voices in it, the same voices that instructed Ronald DeFeo to kill his family. 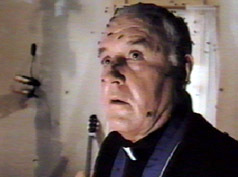 In a confrontation with Father Ryan (Murray Hamilton), he insists the Lutzes are in danger. Jeff (Michael Sacks), George's co-worker, visits the house with his wife Carolyn (Helen Shaver). But Carolyn refuses to go near the home. Meanwhile, Greg and Matt are teasing Amy from a second story window...which abruptly shuts closed and jams on Greg's hand. George and Kathy are able to free the boy and rush him to the hospital for observation. Surprisingly, none of his bones are broken. That evening, George wakes up at 3:15 and finds one of the rooms swarming with flies. Suddenly a gust of wind from INSIDE the house blows the front door out. Before the police get there, George goes back into the room and the flies are nowhere to be found. Sergeant Gionfriddo (Val Avery) cannot figure out what happened. In addition, he's disturbed by the fact that George bares an uncanny resemblance to Ronald DeFeo. All the officer can do is promise to keep an eye on the house, since the only explanation for the busted door is a robbery attempt. While in the basement, he notices that Harry the dog is agitated by something behind a brick wall. Kathy tries to find out more information from Amy about Jody and discovers that this "friend" has told the girl about the DeFeo murders. She also tries to phone her priest again, with no success. George goes to the library and steals a book about the supernatural - and then meets Jeff at a bar. His friend is upset that George has changed and has been neglecting his work. Later, while George is discussing the strange occurrences with Jeff and Carolyn, Kathy is frightened by a glimpse of Jody. She sees two red glowing eyes (belonging to what appears to be a pig) just outside of Amy's room. While looking through the book that George took from the library, Carolyn gives her opinion that the Lutz house is built on some sort of burial ground where sacrifices took places centuries before. Jeff tells George that he and Kathy should go out that night and forget about their troubles, offering to babysit the kids. Carolyn can't resist the urge to go down into the basement. She's getting bad vibes and finds Harry scratching at the wall. Kathy is determined to leave the house, especially after finding a crucifix upside down and covered in soot that she had hung on a wall. While George is holding the cross...it suddenly gets unbearably hot and he drops it. Kathy tries to pick it up but develops welts on her hand. 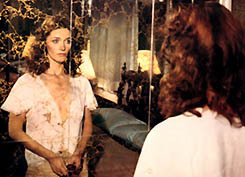 She runs into the bedroom and sees her face disfigured in the mirror. Kathy has a nightmare that she finds George slaughtering Amy with an ax before turning it on her. Kathy finds cuts on George's foot that look like teeth marks. The two of them are both volatile and get into an argument. George smacks his wife in the face. Meanwhile, Father Bolen goes to visit Father Delaney but gets no response from him. Sgt. 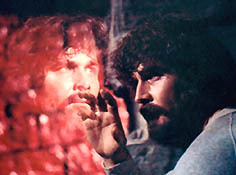 Gianfriddo is following Father Bolen as he attempts to figure out the connection between the house and the older priest's condition. Kathy goes to the library to take a look at the newspaper accounts of the DeFeo killings. To her horror, she finds that her husband is the spitting image of the murderer and rushes back home. There's a fierce thunderstorm and the sight of George holding an ax leads Kathy to believe he's going to kill her and the kids. He doesn't...and it appears for a second that Kathy's appearance has changed to that of an old hag. The house is now coming alive and the walls are bleeding. 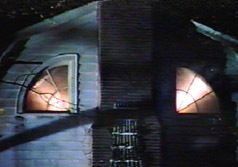 The family tries to escape as the windows are breaking apart and the floor in the basement is coming undone. They make it to the van but the kids don't want to leave the dog behind and George runs back in to save him. Harry is in the basement and George falls through the floor and into a thick mass of sludge. Harry helps pull him out and the two of them make it safely back to the vehicle. They speed off and never return, leaving their belongings behind. 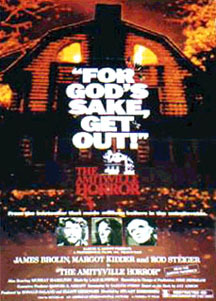 The Amityville Horror is helped tremendously by an extremely creepy score composed by Lalo Schifrin, which was nominated for an Academy Award. Hard to believe - but it had been rejected for The Exorcist six years before. 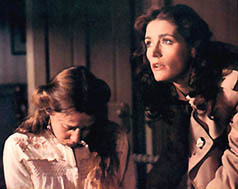 As always, Margot Kidder is excellent...fresh from her success in Superman the previous year. 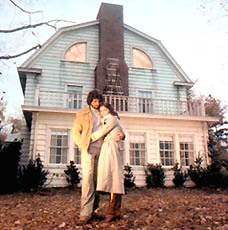 The outdoor scenes were filmed in Toms River, New Jersey and the actual house was moved at some point to make room for another home. The infamous structure was also given a makeover...it was painted blue and the attic windows (that looked like eyes) were replaced. This was followed by a sequel, Amityville II: The Possession (1982) directed by Italian filmmaker Damiano Damiani. An entirely different style due to its source, Damiani's feature has developed its own following over the years. An inevitable remake arrived in theaters in 2005...with predictably poor results.